Heceta Head Light was built in 1894 and is surely one of the more picturesque lighthouses on the Pacific. 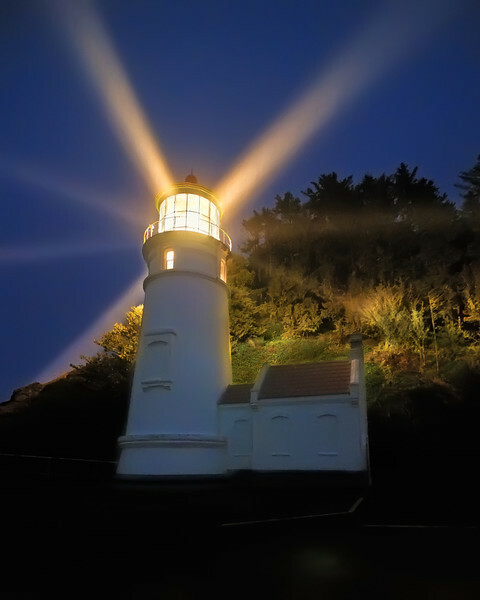 Heceta Head, at 56-foot (17 m) tall, shines a beam out to sea visible for 21 miles (34 km), making it the strongest light located on the Oregon Coast. Shot Notes: I was shooting under a near near cloudless full moon night-- and right before I left the weather drastically turned, with fog and rain really popping the beams out like spokes or a crown around the light. The trick was to get a short enough of an exposure to preserve the spokes of light with the quickly fading moonlight. It turned out I had to open up to f/2.8 at 3200 ISO to get the exposure length I wanted. After I had that, I shot another exposure for the lighthouse fresnel lens that kept more detail. I really got incredibly lucky with the perfect mix of moonlight and rainy fog to pull this off. One other trick I used was to take more than one exposure at 3200 ISO so I could have a few shots of the hill behind the lighthouse. Without there would be two burned out circles where the lighthouse beams struck the hillside. I simply waited for the beams to be in a different location and re-shot. I then used the extra exposure in post to blend away the two hot spots. Sadly, with the quickly changing light there was not time for another long exposure at 200 ISO for the lighthouse structure to limit noise, but I am pleased with the noise levels after some NR work in post. Let me know what you think.